Ray Rice, Donald Sterling, Danny Ferry, and surveillance technology: Cameras and recording devices are delivering justice. Surveillance technology is taking away our privacy—and punishing people who deserve to be punished. 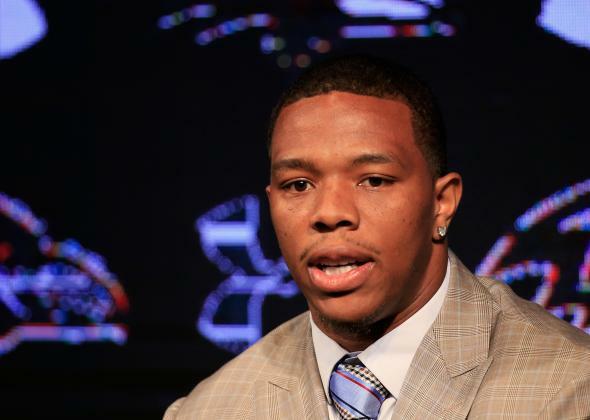 Ray Rice of the Baltimore Ravens addresses a news conference, with his wife, Janay (not pictured), at the Ravens training center on May 23, 2014, in Owings Mills, Maryland. Ray Rice punching his fiancée in an elevator. Donald Sterling ranting about minorities. Danny Ferry, the general manager of the Atlanta Hawks, repeating a slur against Africans. Witnesses in Ferguson, Missouri, reacting to Michael Brown’s killing. We don’t have to imagine these scenes. We don’t have to wonder what Rice did or Sterling said. We can see or hear the truth directly, thanks to recording devices. Surveillance technology is taking away our privacy—and delivering justice instead. In February, Rice and his then-girlfriend, Janay Palmer, were arrested for fighting in a casino elevator. A police statement said “both Rice and Palmer struck each other.” TMZ released video of the incident, showing Rice dragging Palmer out of the elevator. But Rice’s attorney said the story was more complicated. The video, he argued, “is not the complete event, but is merely the end result of what transpired.” The NFL, claiming to lack clear evidence (an excuse that’s since been disputed), suspended Rice for only two games. This week, TMZ published surveillance footage from inside the elevator. It shows Rice knocking Palmer out. Rice has now been cut from the Baltimore Ravens and indefinitely suspended from the league. In April, NBA Commissioner Adam Silver banned Sterling, the owner of the Los Angeles Clippers, from basketball for espousing crude racial prejudice in a conversation with his girlfriend. When asked why the NBA hadn’t previously disciplined Sterling for cases in which he was sued for housing and employment discrimination, Silver noted that “there was no finding of guilt” in those cases. Witnesses had testified that Sterling made specific racist statements, but that wasn’t enough. Until TMZ published the audio of the conversation, Silver maintained that “nothing I’ve ever seen firsthand” had clarified Sterling’s views. In June, during a conference call with Hawks management, Ferry discussed players the team might pursue. According to a summary by one of the team’s owners, Ferry said one free agent, Luol Deng, “has a little African in him. Not in a bad way, but he’s like a guy who would have a nice store out front but sell you counterfeit stuff out of the back.” Ferry couldn’t deny the quote, because the call had been recorded. He was able to keep his job, arguing that the slur was part of a scouting report he hadn’t written. But an investigation of the incident unearthed a racially inflammatory email by the team’s majority owner, who, as a result, has agreed to sell the team. In August, a policeman shot and killed Michael Brown in Ferguson. Six days later, the Ferguson police released an incident report alleging that Brown had robbed a convenience store before the shooting. To back up the report, the police distributed surveillance video of the robbery. This week, however, CNN released additional video from the scene of Brown’s death. In the new video, two white witnesses, staring at the shooting they’ve just seen, insist Brown had his hands up when he was gunned down. Recording devices worry civil libertarians. When the NBA banned Sterling, many people objected that his remarks, while repellent, were private. That’s a healthy concern, and it should give us pause. But privacy, broadly interpreted, can shield injustice. “Domestic violence and sexual assault are often hidden crimes,” the NFL noted in a review of Rice’s suspension. Without the elevator video, his abuse would have remained hidden. When the Ferguson police released the video from the convenience store, civil libertarians were furious. They said it was irrelevant and was being used to smear Brown. But as CNN’s new footage demonstrates, cameras can show more than the authorities intended. Live by the video, die by the video. In law, the presumption of innocence is vital. We can’t go around jailing people without trial. But in sports, where the penalties are only financial and the standards of proof need not be so strict, deference to courts can become an excuse for laxity. The NBA never punished Sterling for housing discrimination because his settlements of the lawsuits didn’t acknowledge guilt. The NFL said its two-week suspension of Rice was adequate because a court had agreed to put him “in a diversionary program with no discipline.” If nobody knows what really happened, league officials can take the easy way out. But with video, everybody knows. The punch Rice threw isn’t just on the elevator camera. It’s on TMZ. Goodell can deny that he saw the video when it was allegedly sent to an NFL executive, but he can’t deny that he saw it when it was posted on the Internet. The Rice video, like the Sterling audio, is a mass social event. When the NFL and Ravens brass saw it, they didn’t just know what happened. They knew that we knew that they knew what happened. Deniability was dead. None of us wants to live in a surveillance state. But the world before surveillance—the world of unrecorded beatings, rapes, and lynchings—was no golden age. When I see the video of Rice punching his fiancée, I think of another woman who was assaulted by her athlete boyfriend almost exactly one year earlier. Reeva Steenkamp, who was dating Olympic runner Oscar Pistorius, died after being struck by three bullets from his gun. Thursday, he was acquitted of murdering her. “There were no eyewitnesses,” said the judge. Too bad there wasn’t a camera.